Ok, so I know that you’ve got better things to be doing than reading newsletters from me, but the last one of these was months ago – nearly 12 months ago. While I don’t want to inundate you too often, the intention was to say hi to you once a month. What’s been happening? Quite a lot as it would happen. I set myself a bucket list of sorts for the winter – things I wanted to do. I posted something about it here. I’ve done much of what’s on this list, plus more. It’s been an action packed few months. The highlight? That would be a toss-up between whale watching out of Mooloolaba and a scenic flight in an open cockpit biplane. Both thrilling. I also, only partly because I had Callie, my protagonist in I Want You Back going to classes, went back to Bellydancing for Beginners. I’m also letting loose once a week at No Lights No Lycra. What’s that? Dancing in the dark, essentially. You can read more about it here. I Want You Back has gone off for copy edit. It’s turned into a very different book from the one I first envisaged and has been one that at times has felt as difficult as pulling teeth. I’m certainly hoping that it doesn’t read like that, but it is, at this point that I really start second guessing myself – although I’ve been second guessing my whole way through this one. It’s a mindset thing, I suppose. I’ve also asked Jacinda to begin looking at the cover design. As it’s part of my Melbourne Girls series (I really do need to come up with something better than that) I’ve asked for a similar cover design to Baby, It’s Youand Big Girls Don’t Cry. I’ve sent through a few ideas for colours and pictures, so lets see what she comes up with. In the meantime, I’m well into the first draft of Tiff’s story. It doesn’t yet have a name, although I am flirting with I Don’t Believe In Love… I suspect that my personal favourite What’s Love Got To Do With It? could be under copyright, so let’s not risk that. For now it’s known simply as Tiff’s book. I’m going through a bit of a re-branding exercise at present. to redesign the themes of and anyways and navigator so they fit with the branding. Given that I’m busy writing, I’ve engaged my cover designer, Jacinda May, to look into this for me. The days are getting longer – and warmer. Spring is definitely in the air. At the markets strawberries and avocadoes are still cheap. This week I bought 3 x 500g punnets of amazing strawberries for just $5. Although not strictly yet in season, passionfruits are also plentiful and, at $4 for a bag of about 12, are already quite affordable. 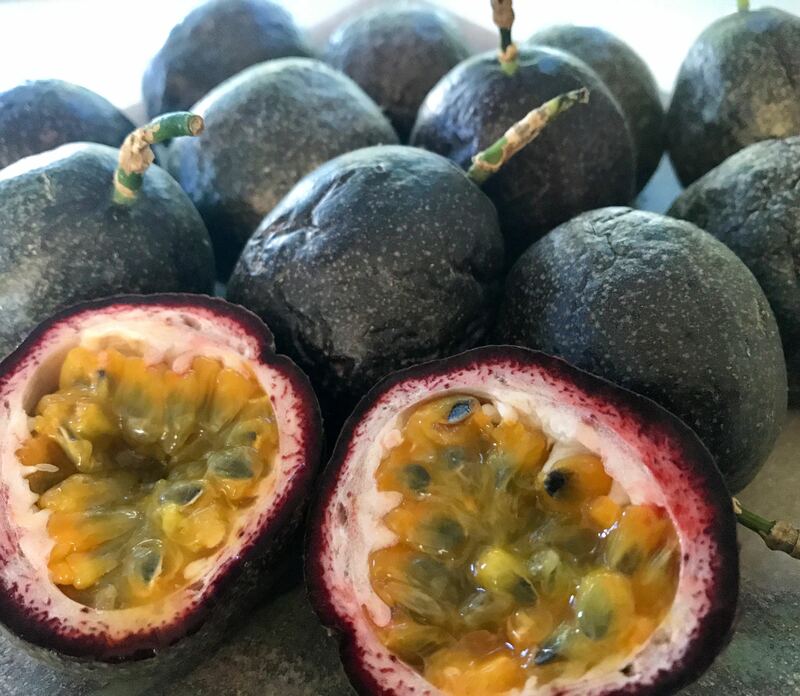 I’ve been having these passionfruits most mornings for breakfast. Unsweetened natural yoghurt from Maleny cheese, strawberries, and a handful of Pip’s Real Food crunch. All local, all fresh, all good. 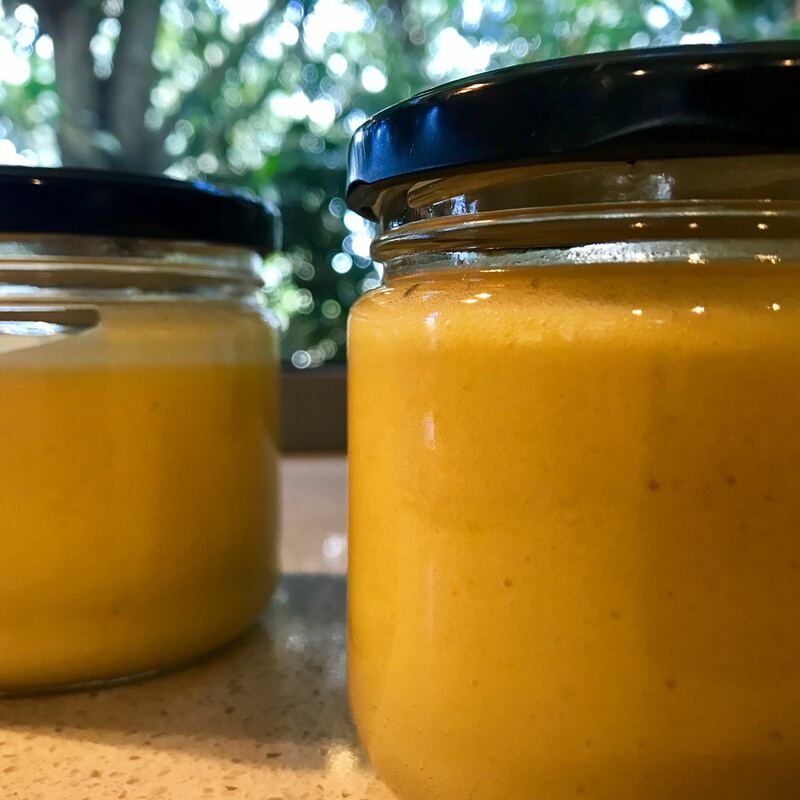 I also took an entire bag of passionfruits and turned them into passionfruit curd. This turned out so well that I’m considering replacing the lemon curd on my Christmas pavlova with this instead. As an aside, if you need the recipe for the lemon curd pav, you’ll find it in Simply Nigella or here on Nigella’s site. We spooned it into little pastry cases for a simple dessert and topped it with sliced strawberry. I could, of course, have used the leftover egg whites for a quick meringue, but I was too lazy. Grant and Sarah spooned it onto fresh baguette with fake spray can cream. They were in heaven, but I’m still wondering who brought that canned fake cream into the house. Anyways, if you want the recipe, you’ll also find it in Nigella’s Feast book or here. I also used some passionfruit in little yoghurt panna cottas – sadly there are no photos as these looked crap on the plate – white on white with just a little interest from the yellow of the passion fruit pulp on top…boring. But then, I’ve never pretended to be a food stylist. Anyways, I’ve popped the recipe up on the website. The recipe is on the website. You’ll find it here.